Barcelona have reportedly identified Chelsea centre back Andreas Christensen as a January loan target. According to Sport, the La Liga champions would like to sign Christensen on an initial six-month deal, with the option to buy him in the summer. It is claimed that Barca are trying to recruit cover for Samuel Umtiti due to the Frenchman’s injury issues. 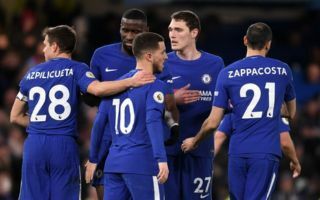 Christensen has only featured in one Premier League game this season, with David Luiz and Antonio Rudiger preferred by manager Maurizio Sarri at centre back. And, per Sport, the 22-year-old Dane is ‘totally willing’ to move to Barcelona, but Chelsea are not satisfied with the six-month proposal on the table. Christensen – who earns £35,000 per week according to The Express – has been a Chelsea player since 2012 and has achieved homegrown status with the club, making him a valuable player to balance out Premier League and Champions League squads. Although he has spent much of this season warming the bench, he featured regularly last term when he started 34 games in all competitions under former boss Antonio Conte.